Paul Wenz (1869-1939) was a Frenchman who became an Australian grazier and author, contributing to the myths of the Australian Legend, in French. Diary of a New Chum and Other Lost Stories (1990) is the first collection of his stories in English. Frank Moorehouse contributes an unnecessary Preface which indicates some points of interest in the various stories, but happily there is a much more interesting Introduction by the collection’s editor, Maurice Blackburn. Wenz the horseman and sheep farmer personally appreciated the poetry of Adam Lindsay Gordon and the bush balladists, like the rest of his class, and was a regular reader of the Bulletin… he knew well and greatly admired the stories of Henry Lawson, and recommended him to Gide; his own bush stories show that he was certainly influenced by the new Bulletin school of writing that was at its peak in the period 1890-1905. Blackburn also detects elements of Steele Rudd, Barbara Baynton and Joseph Furphy. Diary of a New Chum, which is less than 40pp, and is the one story originally written in English, was first published in 1908, apparently as a book, under the pen-name Paul Warrego. Until this edition it had not been republished since the 1920s. The protagonist attends a fancy dress ball (presumably in England) and after too much champagne falls hopelessly in love with a French peasant “displaying pretty arms and very shapely legs”. The next morning he discovers that he is engaged to be married to Miss Mary Smith and that his only recourse is to flee to Australia. As a ‘new chum’ on an Australian sheep station he recounts his trials with understated humour, in short episodes, as he learns on the job and attempts to escape his engagement. The remainder of the collection consists of 8 short stories, first published in the collections A l’autre bout du monde (1905) and Sous la Croix du Sud (1910), three previously unpublished texts, including an account of his meeting Jack London in Sydney in 1909 (Wenz subsequently translated London’s Love of Life into French), selected letters, including to André Gide and Miles Franklin, and some photographs of Wenz and his property near Forbes, NSW, and including, again, Miles Franklin. Most of the short stories are fairly ordinary, not up to the standards of Henry Lawson, nor even Steele Rudd. Charley for instance, notable only for being translated by Margaret Whitlam, is just a few pages leading up to the pathetic death of an old rabbiter. The story I liked the best, The Waggoner, which left me with a tear in my eye, tells of a young girl growing up as her father’s companion as he services the stations out past the Darling in northern NSW, carting supplies out and wool back in, with his heavy red gum waggon and team of 18 horses. Old Mary … recounted how her tribe, accused of having speared to death several head of cattle, had been ‘dispersed’ by the police; and except for herself and Picky, the whole camp, eighteen men, women and children, had been killed by the troopers. And some of the racism is plain gratuitous, for instance: “Thompson knew the natives, and had killed two or three out of necessity, yet he wasn’t a cruel man.” The early part of the story recounts the efforts of Thompson’s daughter to make Picky a Christian, despite Picky’s clear preference for the company (and tucker) of her grandmother, and the latter part how Picky and Old Mary gain their revenge on a ‘blacktracker’ who had participated in the massacre of their (and his) fellows. The letters too are interesting as Wenz discusses with Gide his writing, problems with getting published, and meeting other authors such as Joseph Conrad and JM Barrie. In 1933 Gide worries that Wenz’s French is becoming too Australianized – “some errors or infelicities of expression lead me to think that many of the sentences have first been thought in English” – and gives him some examples, with corrections, from his latest ms.
Wenz also corresponds with AG Stephens (of the Bulletin) and with Miles Franklin. The latter who has met Wenz on his sheep station while travelling with Frank (and Mrs) Clune, sends him a copy of Back to Bool Bool “which I consider goes more beneath the surface than the general run of Australian novels.” A month later Wenz asks her, “Does anybody know who the author is?” (It is of course MF under the pseudonym Brent of Bin Bin). Wenz also reads My Brilliant Career, MF’s copy presumably as by 1937 it had been long out of print, and puzzles “to get the ‘real’ out of the imaginative – so naturally and vividly it is written.” MF has read some of Wenz’s novels and they discuss MF translating them, which indicates that at some stage after leaving school MF has become fluent in French. The book ends with 20 pages of Notes dated from 1834 – the birth of Wenz’s father – to 1959 – the death of his wife. Wenz was only a minor author but he was nevertheless a valid contributor to the Legend and a genuine member of the Australian, French and to a lesser extent, the English literary scenes. 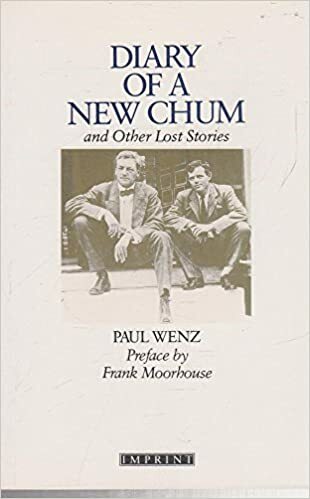 Paul Wenz, Diary of a New Chum and Other Lost Stories, Angus & Robertson/Imprint, Sydney, 1990. Edited and translated by Maurice Blackburn. Translations by Patricia Brulant, Margaret Whitlam and notes by Jean-Paul Delamotte.